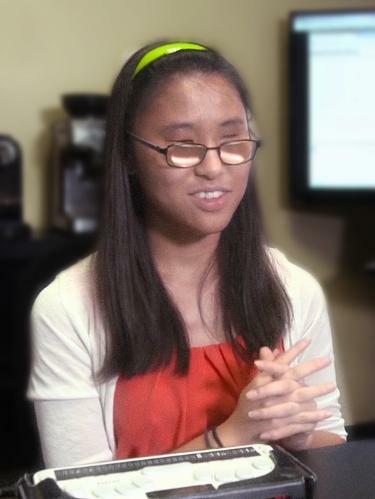 As an incoming high school senior, Ms. Park became the youngest member on the team of a for-profit, British-based company developing a product for high-stakes testing environments. "Taking the job was very scary and surreal," she said. "I basically didn't expect anything to come of my comments, so I was very thankful that my manager thought me important enough to put me on his team. Now, students who are blind or have low vision and want to tackle advanced math can do so." As a high school junior, math classes were a struggle for Su Park, but not for the reasons that you might expect. Ms. Park is blind, yet reading braille wasn't the struggle. The real problem was that the software Ms. Park was using to do her assignments was not properly translating the mathematical equations from print to braille. In 2015, Pearson Education, one of the leading publishers of academic textbooks and assessments, was in the midst of developing a product called TestNav. Designed for online, high-stakes testing, the product featured a mathematical equation editor, which teachers could use to include complex formulas and questions on their web-based exams. However, the equation editor was not yet accessible to the blind. Out of "pure luck," as Ms. Park puts it, a teacher of blind students in the Austin area heard that the developers wanted to get students' feedback on their difficulties in a math classroom, and connected them with Ms. Park. As it was, the visitor to Ms. Park's class was the lead developer of the pesky equation editor. "I told them about the issues that blind students like me were having in math, which was the braille was very incorrect while translating between Nemeth and print, and vice versa," she said. "My teachers didn't know how to write math in braille and the translation software was bad due to various coding issues. I said, 'If you guys could somehow make a program that took advanced math—like Algebra II and up—translated it accurately from print to braille (and back again), and had no little bugs (like the one that might convert superscripts to subscripts), that would be great.`"
Three weeks later, the department manager sent her an e-mail asking if his revised program had correctly translated the quadratic formula into braille. To Ms. Park's surprise, the attached file read perfectly on her refreshable braille display. "For the next two or three months, we were e-mailing back and forth about the equation editor almost constantly," she said. Later that spring, the manager, Sam Dooley, asked Ms. Park if she would be interested in an internship, saying: "You know math, you know braille, you know the issues, you're on board." As an incoming high school senior, Ms. Park became the youngest member on the team of a for-profit, British-based company developing a product for high-stakes testing environments. "Taking the job was very scary and surreal," she said. "I basically didn't expect anything to come of my comments, so I was very thankful that my manager thought me important enough to put me on his team. Now, students who are blind or have low vision and want to tackle advanced math can do so." It was immediately clear to Ms. Park that her manager was committed to full accessibility even before she set foot in the office. In just six months, Mr. Dooley learned Nemeth braille. He then hand-coded the translation rules found in the Nemeth specifications into the equation editor, and then added hand-generated alternate text so that a user could see both the visual and Nemeth output of the equation editor. After pairing the computer with a refreshable braille display and screen reader, Ms. Park was then able to test the testing software and give feedback accordingly. Her job was daunting: find every break point for the editor. "Nine hundred and forty-eight equations were a lot to test," she said. "But the stunning part of it all was just how much coding had gone into those equations... and how much more there was still to do. After testing about 600 equations, I finally began to realize that this program was real. This software finally leveled the playing field for all of us." Ms. Park had tested all 948 equations—and given feedback accordingly—in just less than two days. Pearson is making giant developmental leaps in the progress of the TestNav system for braille users. Without divulging too much, Ms. Park offered a sneak peek of insight as to what is to come. "For now, the equation editor can take QWERTY input from a sighted user and translate it to braille," she said. "At the same time, it can also take braille input from a blind user and translate it into print. While still in the early stages, we expect to have more capabilities soon, as well as a pilot-testing site." While Ms. Park wasn’t a member of our mentoring program during her internship, she now hopes to give back and assist younger students. “I hope that I can spread the wonderful support system that I’ve received,” she said. Mr. Dooley and Ms. Park will present their work at the 2016 CSUN Conference, which is internationally recognized as the premier event for technological innovations that help people with disabilities.